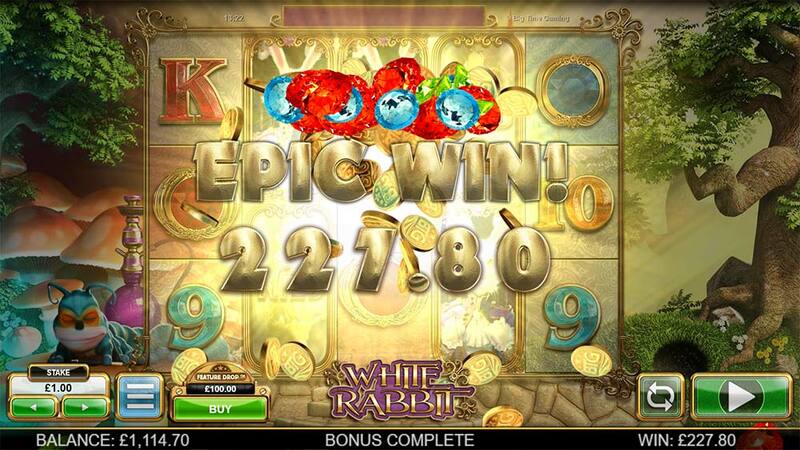 Get ready to jump down the rabbit hole in BTG’s new Megaways slot White Rabbit! 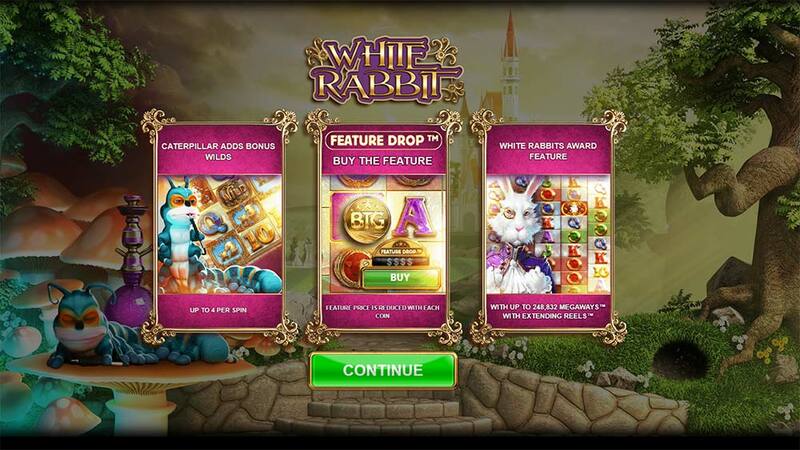 LeoVegas Casino has recently added the latest Megaways slot from Big Time Gaming titled White Rabbit to their casino, this is currently an exclusive slot release with an expected general release date of the 8th of November. 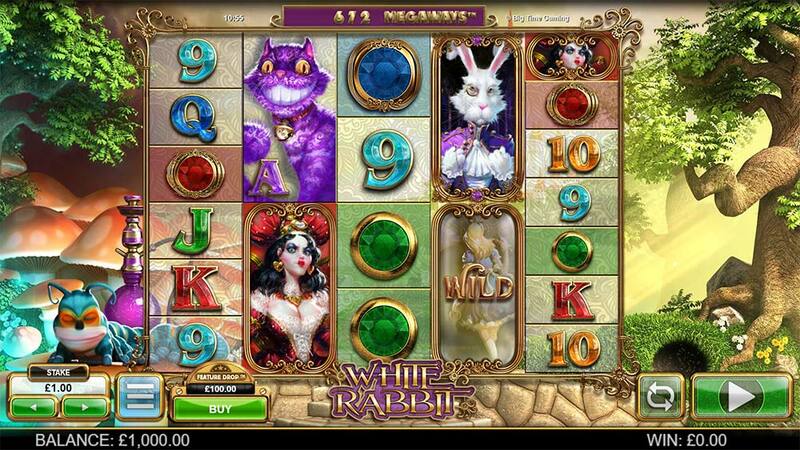 The White Rabbit slot looks to based on the Alice in Wonderland story with the main bonus round going down the rabbit hole and some weird and wonderful characters making up the reels strips. For players unfamiliar with BTG (Big Time Gaming) slots and their Megaways feature you are in for a treat as past releases such as Danger High Voltage!, Bonanza, Queen of Riches and Dragon Born have all been very popular releases for slot players given their unusual payline structure and insane win potential. White Rabbit has the usual Megaways payline structure at play in the base game along with a few notable additions, next to the Stake setting you will find a Feature Drop button, by selecting this you can instantly trigger the main bonus round at an initial cost of 100x stake. Playing normally in the base game you can also collect BTG Coins, these will gradually reduce the cost of the Feature Drop, the bigger the coins that land in view the bigger the reduction in cost but this reduction in cost only applies to the current bet level. In the base game, there is only one extra mini-feature which is a randomly triggered feature with added wilds being blown onto the reels from the caterpillar, generally, this isn’t too impressive but if a lot of wilds and a good number of Megaways appear this can create wins well in excess of 100x stake. 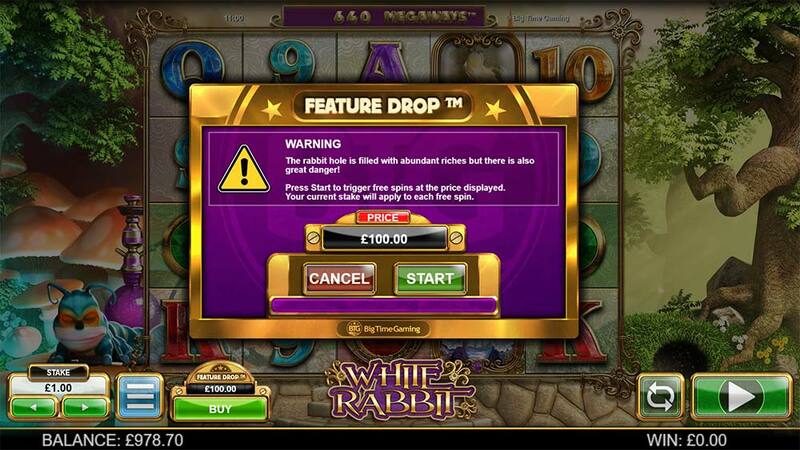 The main excitement, however, takes place in the free spins bonus round which is either triggered by landing 3 White Rabbit Scatters on the middle reels or by paying the premium cost for the Feature Drop. 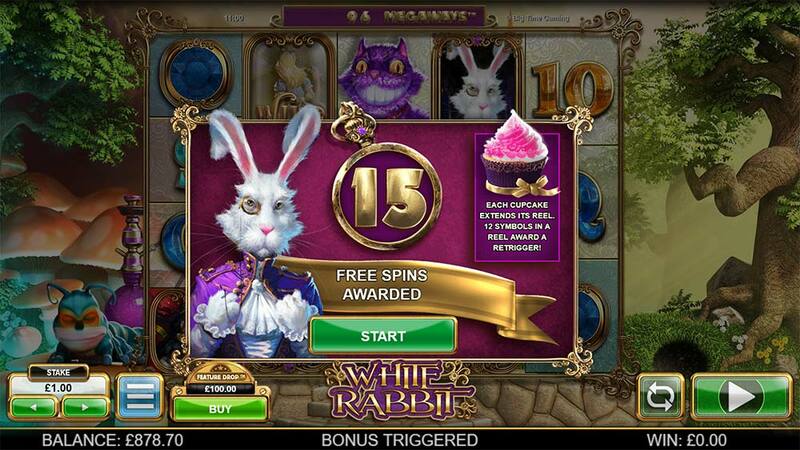 The main bonus round is triggered by landing 3 of the White Rabbit scatter symbols on the middle reels or by selecting the Feature Drop (initially 100x stake) this grants you with an initial 15 free spins with the possibility of re-triggers. The initial Megaways in the bonus round is much greater than the base game although this also varies with each bonus round depending on the starting reel arrays and how many symbols are present on them. During the free spins, you are initially looking out for the special Cupcake Symbols, when these land in view the reel expands by 1 position and hence increases the number of Megaways on the next spins. The reels can grow to a maximum of 12 symbols in height and if you manage to reach this you are granted a re-trigger with from 1-12 extra spins awarded and this reel then becomes a Queen’s Reel with added wilds and extra Queen Symbols. All 5 reels can expand to 12 in size giving the maximum 248,832 Megaways paylines making this a super high variance slot. 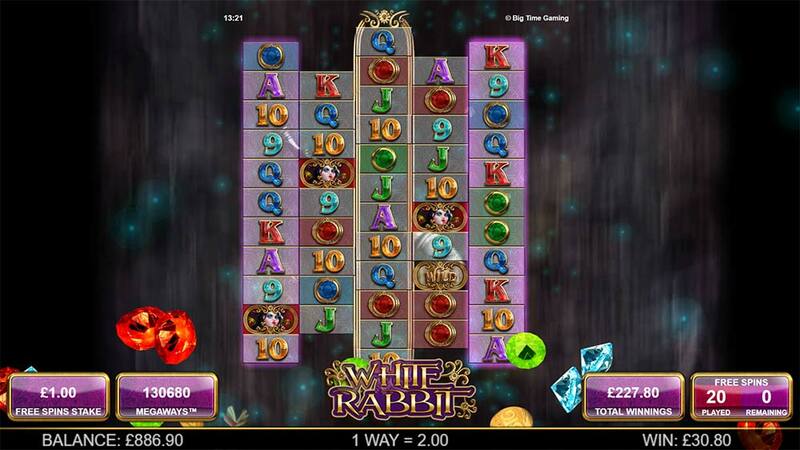 White Rabbit is another superb slot release from Big Time Gaming who time after time seem to be producing incredibly innovative slots and bonus features with amazing win potential too. Whilst the “Buy A Bonus” feature drop does sound quite crazy at an initial 100x stake we did some thorough playtesting, in a 10 bonus round back to back Feature Drop test we had the lowest win of 40x stake and the highest win of 134x stake which gave an overall real session RTP of 97.40% which is pretty close to the 97.72% Theoretical Feature Drop RTP. Further testing after this with around 100 bonuses now played saw a low of 14x stake and the biggest win of 256x stake with 1 “Queen Reel” triggered, with wins of several thousand times stake possible for lucky players who manage to trigger several Queen Reels. Overall, one to check out- have a good test of the bonus feature in play mode using the Feature Drop to gauge just how volatile this slot is!